Jil Sander will launch Ultrasense, a new fresh aromatic fragrance for men, this month. The notes include bergamot, black pepper, fir balsam, sage and white musk. 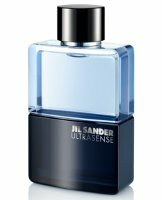 Jil Sander Ultrasense will be available in 40, 60 and 100 ml Eau de Toilette. Update: Ultrasense was developed by perfumer Olivier Pescheux. I’m a Jil Sander fan! really looking forward to this! P, do you buy these in the US? Where? I never see Jil Sander fragrances, not since that Style trio.